Khloe Kardashian was spotted at the Houston Rockets Denver Nuggets game on Wednesday cheering on boyfriend James Harden and was back at the hospital in LA with her estranged husband Lamar Odom on Friday. "I pulled back on the divorce because there is no rush for it. For medical decisions and a ton of other things, it's just smarter that it's put on hold. But that does not mean I'm back with Lamar. It's not even in our brains to think about us having a relationship. Only time will tell." I'm sure the sympathy points went way down when she was seen chasing after Harden. This is for publicity only....I mean really...a married woman with a husband in the hospital goes to see her boyfriend. If they weren't so rich, they would all be on Maury. .. Trashy publicity seeker - can't wait for their 5 mins to be over. Anyway, how is LAMAR ODOM doing? yeah but we can't get news updates about Lamar Odom and his condition because the Kardashians are too busy working their own story lines and using him as a prop or whatever as usual. The sad thing about this is two people playing with god. The two of them Lamar and Khole is they made a vow before god. Lamar, is now going through, Khole will be next, and all the people she slept with EVERYBODY REMEMBER THIS POST.at some point in time you will look back and see it was right, Adultery is a sin and all involved parties will suffer in the end. They will lose it all and then blame GOD...my elders taught me Don't never, never mess around with a married woman....You will be asking to have trouble come in your life. The Kardashians are a legitimate culture icons. 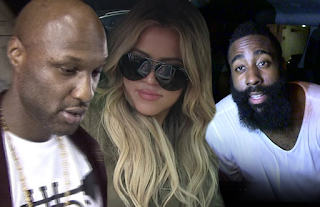 The only reason folks paid attention to that crackhead,Lamar Scrotum is because he was married to Khloe and be coz of his NBA career. Correct, because of his NBA career.